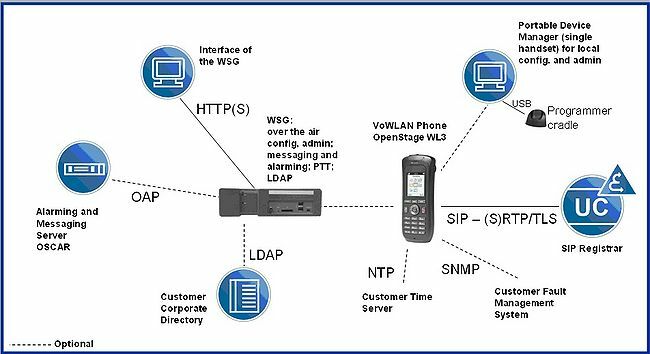 * using [[OpenStage_WL3#Description_of_Features_of_the_Wireless_Service_Gateway|OpenStage WL3 Wireless Service Gateway]]. * using [[OpenStage_WL3#Description_of_Features_of_the_Wireless_Service_Gateway_(WSG)|OpenStage WL3 Wireless Service Gateway]]. * using [[OpenStage_WL3#Description_of_Features_of_the_Portable_Device_Manager_(PDM)| OpenStage WL3 WinPDM]] and USB craddle . * using [[OpenStage_WL3#Description_of_Features_of_the_Portable_Device_Manager_(PDM)|OpenStage WL3 WinPDM]] and USB craddle .